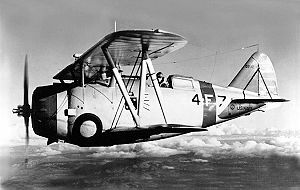 The Grumman F3F was the last American biplane fighter aircraft delivered to the United States Navy, and served between the wars. Designed as an improvement on the single-seat F2F, it entered service in 1936. It was retired from front line squadrons at the end of 1941 before it could serve in World War II, and was first replaced by the Brewster F2A. 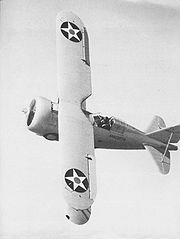 The F3F which inherited the same landing gear configuration served as the basis for a biplane design ultimately developed into the much more successful F4F Wildcat. The Navy's experience with the F2F revealed issues with stability and unfavorable spin characteristics, prompting the 15 October 1934 contract for the improved XF3F-1, placed before F2F deliveries began. The contract also required a capability for ground attack, in addition to the design's fighter role. Powered by the same Pratt & Whitney R-1535-72 Twin Wasp Junior engine as the F2F, the fuselage was lengthened and wing area increased over the earlier design. A reduction in wheel diameter allowed greater fuselage streamlining, eliminating the prominent bulge behind the cowling of the F2F. The prototype, BuNo. 9727, was delivered and first flown on 20 March 1935 with company test pilot Jimmy Collins making three flights that day. Two days later, six dive-recovery flights took place; on the 10th, the aircraft's pullout at 8,000 ft (2,438 m) registered 14 g on the test equipment. The aircraft broke up in midair, crashing in a cemetery and killing Collins. A second, strengthened prototype was built, but it crashed on 9 May of the same year following the pilot's bailout during an unsuccessful spin recovery. The second prototype was rebuilt in three weeks, flying on 20 June 1935. An order for 54 F3F-1 fighters was placed on 24 August of that year, following the conclusion of the flight test program. The first production F3F-1 was delivered on 29 January 1936 to the test group at Naval Air Station Anacostia, with squadron service beginning in March to VF-5B of Ranger and VF-6B of Saratoga. Marine squadron VF-4M received the last six in January 1937. 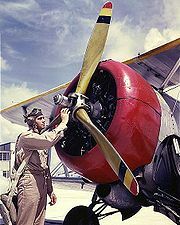 Grumman, wanting to take advantage of the powerful new 950 hp (708 kW) Wright R-1820 supercharged radial engine, began work on the F3F-2 without a contract; the order for 81 aircraft was not placed until 25 July 1936, two days before the type's first flight. The engine's larger diameter changed the cowling's appearance, making the aircraft look even more like a barrel, though top speed increased to 255 mph (410 km/h) at 12,000 ft (3,658 m). The entire F3F-2 production series was delivered in between 1937 and 1938; when deliveries ended, all seven Navy and Marine Corps pursuit squadrons were equipped with Grumman single-seat fighters. Further aerodynamic developments were made to an F3F-2 returned to Grumman for maintenance; it became the XF3F-3, and featured a larger-diameter propeller, among other improvements. On 21 June 1938, the Navy ordered 27 improved F3F-3s, as new monoplane fighters like the Brewster F2A and Grumman's own F4F Wildcat were taking longer to develop than had been planned. With the introduction of the Brewster F2A-1, the Navy's biplane fighter days were numbered. All F3Fs were withdrawn from squadron service by the end of 1941, though 117 were assigned to naval bases and used for training and utility duties until December 1943. A few F3Fs were used by the U.S. Army Air Force as ferry-pilot trainers, under the designation UC-103. A civilian aerobatic two-seat variant, the G-32A "Gulfhawk II," was constructed in 1938 and flown by Major Alfred "Al" Williams (Ret. ), head of Gulf Oil's aviation department. A Grumman F3F-2 was ditched off the coast of San Diego on 29 August 1940 while attempting a landing on Saratoga. The fighter was rediscovered by a navy submarine in June 1988, and recovered on 5 April 1991. It was restored at the San Diego Aerospace Museum. Today, four other surviving aircraft are flying, three F3F-2 models and the Gulf Oil G-32A, which were restored by Herb Tischler's Texas Airplane Factory in Fort Worth. The restorations took four years and consisted of rebuilding the G-32A, from original blueprints with tooling built at the Texas Airplane Factory. The main components of three -2 aircraft which had originally crashed in Hawaii were utilized to complete the other restorations. The F3F-2 was featured in the 1940 film Flight Command, starring Robert Taylor as a pilot whose work developing instrument landing systems helps his lost squadron return to NAS North Island. Perhaps the most prominent and popular record of F3Fs is in the 1941 Technicolor film Dive Bomber, also set at NAS North Island. This film extensively used parked F3Fs as background, and one single aircraft in flight in the last action scene. 1. a b c d e Cacutt 1989, pp. 155–162. 2. a b c Grumman F3F Air Group 31, 27 December 2006. Cacutt, Len, ed. 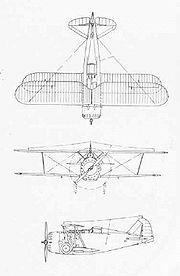 “Grumman Single-Seat Biplane Fighters.” Great Aircraft of the World. London: Marshall Cavendish, 1989. ISBN 1-85435-250-4.